When it comes to audio, it is easy to forget just how good audio can be with your computer. After all, computers can have a lot of processing power. A majority of consumers use the built-in audio connections that are on the motherboard. But if you want really good sound, you need a separate sound card. Sound cards also have many different ranges in price and quality. But if you want one of the best, you may need to look at Asus. Up for review today is the Asus Xonar Essence STX Sound Card and Headphone Amp. It is a dedicated so und card and headphone amp. Fro m the attention to detail in the packaging, I could tell it was a special card. I liked the matte black finish of the packaging. Opening the cover reveals a clear plastic cover that shows off the card. On the back of the cover is a picture of the card and descriptions of its components and features. Opening the box revealed the card, and it's accessories that included two small posters, a user manual, gold plated 1/4" headphone adapter, RCA to 3.5 mm adapter, and a drivers CD. Dolby Headphone technology allows users to listen to music, watch movies, or play games with the dramatic 5.1-channel surround or realistic 3D spacious effects through any set of stereo headphones. Dolby Virtual Speaker technology simulates a highly realistic 5.1-speaker surround sound listening environment from as few as two speakers. Dolby Pro-Logic II is the well-known technology to process any native stereo or 5.1-channel audio into up to 6.1 channel output, creating a seamless, natural surround soundfield. Quality all around w as top notch. All of the connections are gold pl ated. Asus even used Nichicon "Fine Gold" professional audio caps. The use of Burr-Brown PCM 1992 A DAC's was great, as they yield a phenomenal 127 db signal-to-noise ratio. I also liked the brushed black aluminum shroud that covered half of the PCB. And the use of swappable OPA sockets in a sound card to custom tailor your sound is unheard of. This is a sound card that would satisfy the most demanding audiophile. When it came to the listening test, the Asus Xonar Essence STX sound card really came through. It really was distortion free. No Doubt-Hella Good: bass beats were not only nice and tight, but also had good extension and authority. The percussion was very dynamic in the cymbals. The vocals were smooth and not edgy. Don't Ever Let Nobody Drag Your Spirit Down - had a big soundstage with clean vocals that had great timbre. The piano was very natural sounding. The resolution was excellent, and the sound was quite transparent. Imaging was also excellent. Why are People Like That - vocals were smooth with great details. The harmonica solo was really dynamic, crisp and clean, and gave goosebumps! The drums were light with no noticeable pitch decay. Im aging again was excellent, as wa s the sounds tage. And when compared to the audio built into the motherboard, there really was not much to compare. The Asus Xonar Essence STX threw a much bigger and deeper soundstage. Imaging was much better, as was the detail and resolution. The sound was also much cleaner with no discernible distortion. The Asus was just in a whole other league, which is what you would expect for a stereo soundcard with an MSRP of $200. And it delivered in spades. The software that was included - Xonar Audio Center, was very simple to figure out. I liked the spectrum analyzer and EQ presets, such as Rock, Dance, Jazz, Classic, Rap, Metal, etc. There are also DSP's for Movie, Music, Game, and HiFi. You can also change the sampling rate from 44.1 kHz to 192 kHz. The 7.1 Virtual Speaker Shifter was fun to play with, as well as the Dolby Virtual Speaker. There really is a lot of tweaking that can be done. When it comes to sound cards, there are a lot of options. If you went the best sound for your computer, that long list is practically non existent with a signal to make ratio of 124 dB, and 0.0003% distortion, this card packs a huge punch with it's delicious annual treat. Their inspiration came from the 4000 year old Chime of Tiger, and they did a great job. 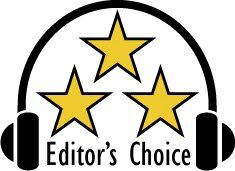 Based on it's performance, quality, and features, it has earned our Editor's Choice Award. For more info and complete specs, check out their website at http://www.asus.com/.